Summer is a wrap and school is starting up again! It's hard to believe that it's tat time of year again. I must say, I'm pretty excited for my classes this semester, I think it will be a good one. Things have been changing a lot for me. I've given up working at Grey Matter Group, so that I can put all my energy into school and working at YETi. It will be great to have the extra time to put toward my projects. 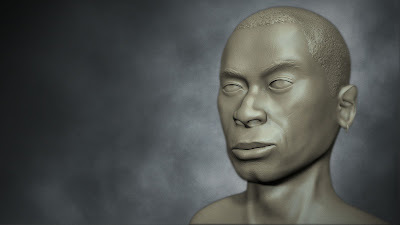 For now, however, here's a quick practice bust I did last week in ZBrush 4 to get myself "warmed up."